I am a collector of many, many things. I have a penchant for rescuing old, beat up, second-third-or-fourth hand furniture. It has gotten to a point where my husband has declared a moratorium on new "treasures." Because if you noticed, I said I rescue...and sometimes it takes awhile for me to get around to fixing up the old furniture I find. Sometimes I just know I have to have a piece...even if I am not sure what I am going to do with it or where I will find a home for it. Sometimes I just cannot let a good piece of furniture go to waste. And sometimes I actually own the piece for months (and I admit years) before I determine how I am going to transform the piece. When I bring home these treasures, I have every intention of restoring some of their former glory and making them beautiful again, with my own special twist. 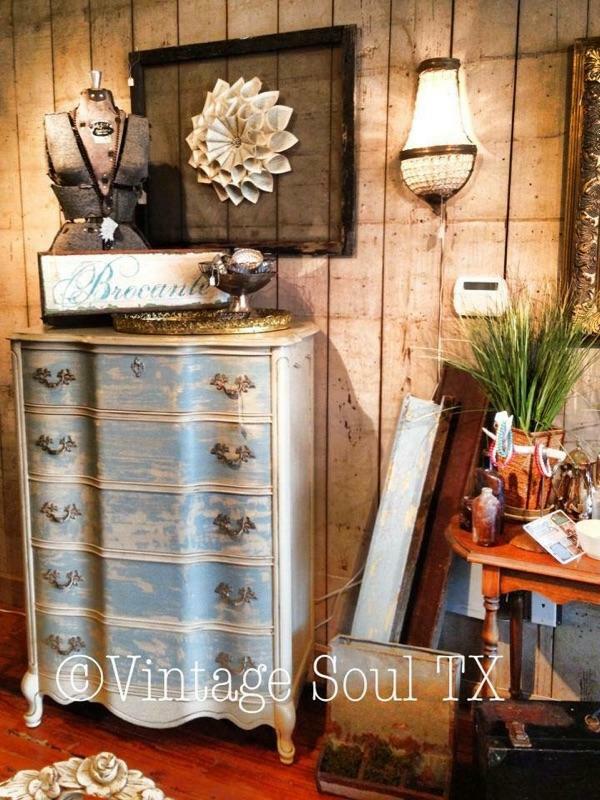 My furniture painting and restoring skills are still at novice level, but Julie from Vintage Soul TX takes the art of transforming secondhand furniture to a new level. Thanks Julie for letting me showcase your talents in these photos. Once upon a time (a long, long time ago) I painted, stripped, and restored furniture without a second thought. Then, however I was young and fearless, and had time to kill. I often found my time being spent trying to save pieces that really could not be saved. I spent a lot of money trying to paint and restore pieces that were too far gone, when in reality I could have just bought a new one for less. I distinctly remember the laminate bookcase I was going to transform - lets just say that was 20 years ago and I am still scarred by the memory. The products cost over $100 and even after following every instruction, the paint scraped, flaked and scratched off. That said, times have changed, my style has changed, and the products available to anyone who wants to paint or restore old furniture are are vast and improved from what they were 20 years ago! Have you explored the idea of creating your own masterpieces from secondhand furniture? Do you just want to spruce up some pieces you already own? I answer yes to both! I in no way whatsoever consider myself to be an expert, but I have learned quite a bit over the years and I think it can help you get started. #1: Look for pieces that are made well. If a piece is solid and sturdy...and a fair price, I am all over it! Good quality furniture is worth the time it takes to paint/stain/refurbish. On the other hand, just the other day I saw a fabulous chair at a thrift store. I even dreamed about it! I went back to get it (and surprisingly it was still there! ), but when I really looked at it, the chair was in disastrous shape. The arms were falling off, a dog had chewed all four legs (beyond repair), and it smelled (the wood smelled). I thought about the work I would have to put into this and realized this chair was never coming back to the glory I imagined, and every time I sat in the chair I would smell that awful smell, even if I managed to make it disappear. #2: Don't tackle projects that are overwhelming for your skill set or experience. If you are a beginner, start small, an occasional table, a wooden crate, a shelf. Recently I have been testing out new types of paints. 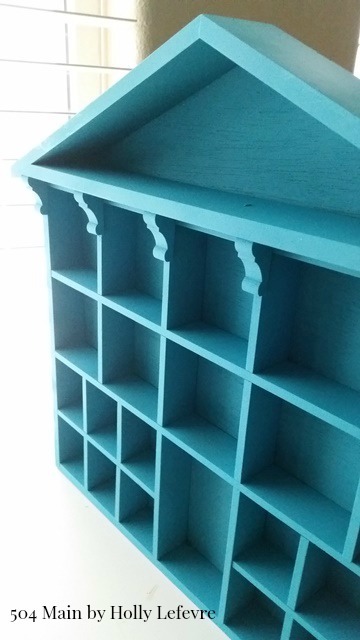 I can almost always find small wooden knick-knack shelves for $5.00 or less. It is the perfect way to test paint color, and improve your skills. I used spray paint chalky-style paint for this small shelf. I was not sure what I thought about spray paint chalky-style paint...but I tested it and LOVED it! #3: Don't fight it, let the piece guide you. I purchased an old waterfall dresser for $25. I thought it was a steal, and I had big plans. It was going to go in my guest room and I was going to strip it, stain it, and reconfigure the drawers to hide the electronics. I started working on it and realized there were 8 layers of paint! OY! And it just seemed like there was a better solution to my electronics issue than rebuilding this piece (because I really, really love waterfall style furnishings). And I really thought the drawers were just not going to stand up to what I had in mind. 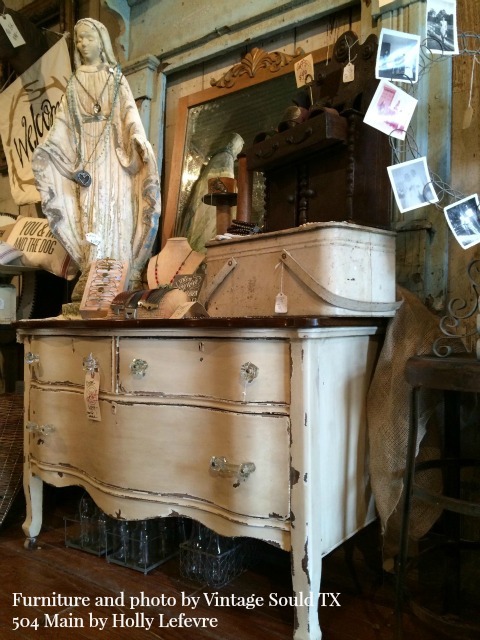 I decided it was a far better decision to admire this dresser without reworking the entire structure. #4: You do not always have to paint. I hear a lot of people complain that real wood is disappearing and that everyone is painting everything (and I kind of agree). Not every piece needs paint to be updated. If you are unsure, give the piece a good cleaning, wipe it down with wood conditioner or use my favorite technique with petroleum jelly. Then look at the details, examine the condition, and maybe just live with it for a bit as-is. I have kept many pieces in their (almost) natural state. I happen to think a few scratches and nicks add character to the right pieces - its like history! You can also simply update a piece with new hardware or wood accents. You might also want to consider painting part of the piece and keeping some of the wood visible. #5: Look at things with a thoughtful, creative eye. 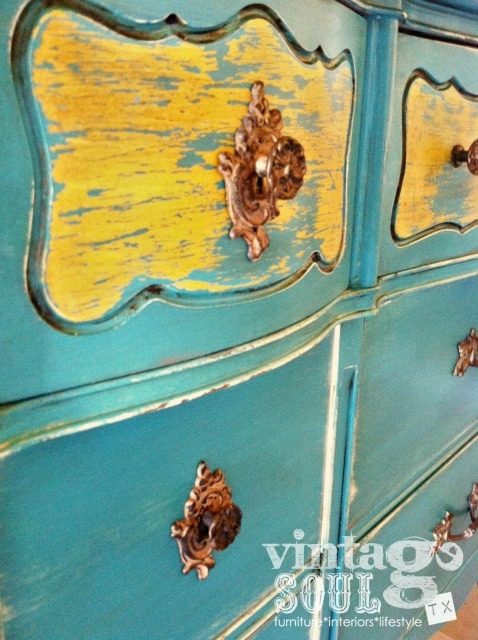 An ugly old 1970's chest or nightstand can have some great character and detail if painted in the right color or given some extra attention. 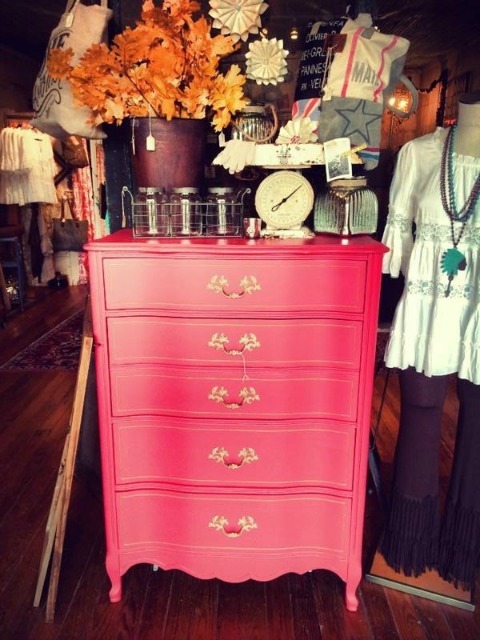 A plain Jane dresser can benefit from some cool knobs and wood accents or decorative painting. You really have to look for the right pieces. Restoring, painting and refurbishing furniture has become a huge hobby and a BIG business. This has made the hunt for good pieces quite challenging, leaving me always looking for that ugly duckling or unexpected piece. 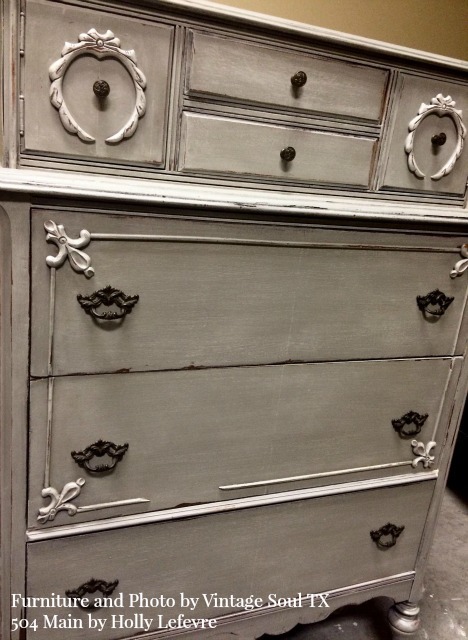 Once you find the right pieces, there are so many choices when it comes to painting and restoring. I admit I use a wide variety of products. I encourage you to explore your options. Chalky-style paint is all the rage, but I had never used it, so I purchased some inexpensive product at the craft store to experiment with. I did like the ease and look of it and now use a more expensive product on my larger or I-am-going-to-keep-it-forever pieces of furniture. On the other hand, I have a friend who despises the look of this paint and is sure glad she sampled it first before beginning her BIG project. For a smooth modern look, you may need have your pieces professionally painted with lacquer or use a paint sprayer. One of my favorite ways to build my color library is to shop the OOPS shelf at the hardware store. From there I can mix, match and create. For me, the hunt for unique, original, and fabulous is my favorite part of the process. Turning these neglected or abandoned pieces into beautiful treasures in my home is the icing on the cake. Do you love the hunt? Or do you prefer the creative process? Whats your best tip? I'd like to thank my friend Julie from Vintage Soul TX for allowing me to show off her beautiful creations! You have some really good tips here, Holly. I have heard about putting petroleum jelly on the edges of furniture before applying paint then rubbing over the edges with a dry rag and whereever the petroleum is on the wood, the paint comes off, leaving a rustic look on the paint job. I have not heard of using the jelly to restore the wood but after seeing how good your door looked, I am going to remember that trick! 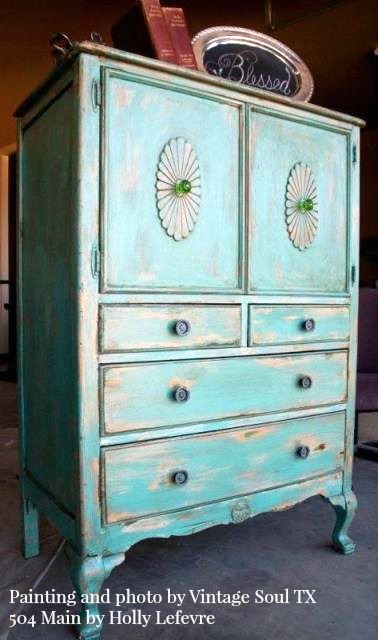 I love old furniture that has been given a new life. I have done a few pieces in my day. You have some awesome tips for hunting down the good stuff and I love your style! Thanks for sharing those tips along with your pretty pics! I just wish I had room to store some "rescue" furniture. No storage space along with limited workspace, has me leaving behind some lovely things when I'm out flea marketing and garage saleing. :( My garage has become a big tool shed and I'd love to evict it all and make it my own little workshop but I think my husband might not be very pleased with that, lol! I totally agree with skipping over pieces that are not structurally sound. I've made that mistake myself, and now try not to spend too much time on rickety furniture. That being said, sometimes they are worth the buy if they can be chopped up and scavenged for accent pieces. I love your list. I've been piddiling in furniture flipping as a hobby for the past couple years and love to learn new things. Its a fun creative process to experiment, fail, try again, learn. 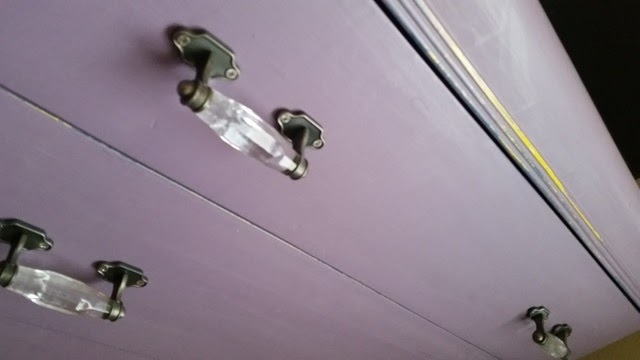 Each piece has its own "attitude" to work with, lol (like your purple dresser).